Fox Theatricals (Kristin Caskey and Mike Isaacson), Tom Gabbard, Amanda Dubois, The Denver Center for the Performing Arts, Nassib El-Husseini, and Thomas Lightburn have brought TRACES, the acclaimed show by the Montreal-based troupe 7 Fingers, to New York’s Union Square Theatre (100 East 17th Street) for 10 weeks this summer, and if you enjoy exhilarating dance and jaw dropping acrobatics, don't miss it. In TRACES, the human body is pushed to its limits as a group of hard-bodied friends leave their mark in a run-down warehouse through acrobatics, music, and dance. 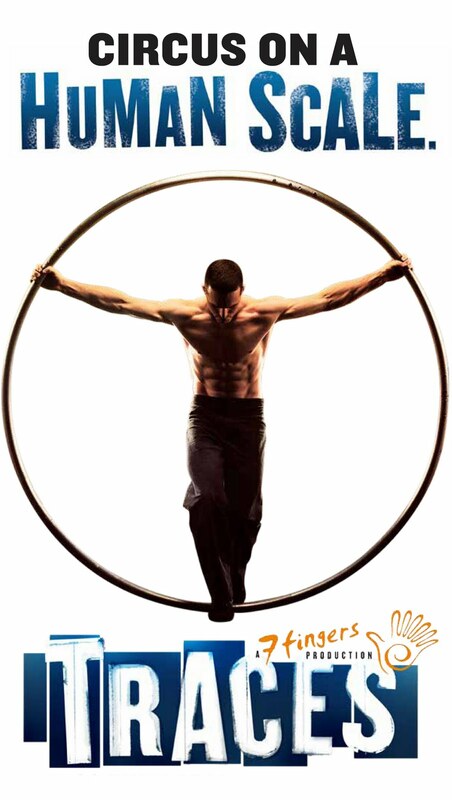 Fusing the traditions of circus with the energy of street performance, TRACES is an explosive display of raw emotion and astounding physicality in an intimate urban setting. TRACES features Creative Direction by 7 Fingers (Les 7 Doigts de la Main) and Direction and Choreography by Shana Carroll and Gypsy Snider. TRACES is performed by Mason Ames, Valérie Benôit-Charbonneau, Mathieu Cloutier, Bradley Henderson, Phillipe Normand-Jenny, Xia Zhengqi, and Florian Zumkehr with alternate cast members Héloïse Bourgeois, Sen Lin, and William Underwood. Les 7 Doigts de la Main translates literally as “the 7 fingers of the hand.” It is a twist on a French idiom (“the five fingers of the hand”) used to describe distinct parts united tightly, moving in coordination towards one common goal. Here it refers to the seven founding directors of the company (Shana Carroll, Isabelle Chasse, Patrick Léonard, Faon Shane, Gypsy Snider, Sébastien Soldevila and Samuel Tétreault) who, by combining their distinct talents and experiences, work towards their common artistic goals with the beautifully awkward dexterity of a 7-fingered hand. With pulsating music, lights, and even some comedic moment thrown in, kids will enjoy as well. My son, age 8, thought it was super cool. I was awestruck by a particularly impressive sequence performed by one troupe member with a large metal hula hoop. You could hear the oohs and aahs from the audience. Another unique sequence was adeptly performed with a Chinese Yo-Yo. It's 90 minutes of non-stop, pure heart-pumping energy that will entertain and amaze people of all ages. Circus on a Human Scale. No Safety Net - No Strings Attached - NO LIMITS. Visit the Box Office at The Union Square Theatre, 100 E. 17th Street, between Park and Lexington Aves. *There is a $1.00 Facilities fee included in the price of each ticket. Producers reserve the right to change or revoke the offer at anytime. Offer expires October 9, 2011. Subject to availability and prior sale. May not be combined with any other offers or discounts. $49 tickets regularly priced $79. All sales are final. No refunds or exchanges. Limit 8 tickets per order. Internet and phone orders are subject to standard service fees. Black-out dates may apply. My son and husband saw it today and said it was "totally awesome!" Interestingly, my husband pointed out that there were quite a few men in the audience with their kids. He said that made him feel even more comfortable. For my husband to rave about a performance, it HAS to be good! !